They shoot hoops with schoolgirls, pose with Christmas trees to wish seasons greetings to Christians and even make the tea. 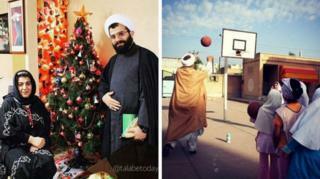 These are not images of Iranian clerics which the world is so used to seeing. But an Instagram account that posts pictures of Islamic scholars in everyday situations has become a social media success in Iran and has more than 12,000 followers. The page is called "Talabeh Today" - a Talabeh being a seminary student who pursues religious studies and who is supposed to adopt a simple devotional lifestyle. It was started by an Iranian seminary student called Masoud Zareian, from the northeastern city of Mashhad, in an attempt to improve the image of conservative clergy and highlight their relevance to contemporary life. The stereotype of an Iranian cleric is often that of a fiery speaker, addressing a crowd chanting slogans against "western imperialism". Liberal Iranians might also tend to think of them as a symbol of all that's wrong with life in the Islamic Republic. The traditionally much-respected men in society rose to influence the life of ordinary Iranians in one way or the other, some argue for the worse, after the 1979 revolution which toppled the Shah. The admiration they enjoyed has gradually faded as some Iranians believe they have not practised what they preached. Zareian, who as well as being a talabeh is also a documentary filmmaker, is a supporter of Iran's clerical establishment. And his decision to use Instagram to portray the nuances of contemporary clerical life is not as odd as it may at first seem. Instagram is very popular in Iran, not only among the urban youth but among conservative sections of society. Twitter and Facebook are officially banned. Image caption Zareian says this photo received very positive feedback from users. He described the page as trying to "reflect a true and real picture of the social life of the clergymen of today's Iran". In an interview with a local newspaper, he said "many people have a wrong perception about us". Zareian went on to say: "I believe if we try to portray the spiritual leaders as innocent like angels, it will look a bit unreal to people. A cleric is just an ordinary person". The page is also now posting photos submitted by its fans. Zareian matches the pictures with anecdotes about eminent religious scholars and ayatollahs, containing life lessons. His religious messages have also been acknowledged among all the praise. For instance, in one of the top photos, a clergyman is shown next to a Christmas tree and a woman. Zareian put it up to wish Happy Christmas to Christians. However, the anecdote alongside the photo tells a heartwarming story of Islamic piety. It is about the lady in the picture who is reported to have been suffering from an incurable cancer. As her last resort, she was asked to pray to a Muslim saint to get cured. She did so and, according to the caption, she was cured. Each photo has been liked by hundreds of people many of whom have made appreciative comments. Some of the descriptions are also in English to cater to a wider audience. Some of the photos however have prompted debates about whether clerics should be seen in public doing things other than religious duties, especially when they are dressed in the clerical attire. Some also questioned the motives behind the page. One user commented on a photo showing a clergyman playing football with kids saying: "Is this kind of act comes from a humanitarian nature or compassion or is it a kind of pretence to influence people and draw their attention towards their scholastic mission?" One women also complained saying that female seminary students are absent in the photos, asking the page administrator to consider putting up photos of female counterparts online. Next story: Why do Kenyans want US help to solve a billion dollar mystery? Image caption US Attorney General Loretta Lynch has yet to respond to the Twitter campaign calling for her to get personally involved.